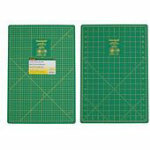 Extremely durable, long lasting, and self healing True grid size plus extra border. 18" markings extend past outer grid eges for easy ruler alignment. Left and right handed numbering and angle system. Inch marks on one side centimeter markings on the other. Double Sided 12" x 18".